"She's a little mischievous… She's a little curious… But above all, she's a little lost." Studiocanal has debuted the full-length official UK trailer for A Shaun the Sheep Movie: Farmageddon, the latest comedy from stop-motion studio Aardman Animations. The first teaser trailer hit last year, but this new trailer is much better. It's a sequel to the surprisingly successful first Shaun the Sheep, originally released in 2015. When an intergalactic visitor – an impish and adorable alien called Lu-La – crash-lands near Mossy Bottom Farm, Shaun soon sees an opportunity for alien-powered fun and adventure and sets off on a mission to shepherd Lu-La home. "It’s close encounters of the herd kind in Shaun’s new out of this world movie." The small voice cast includes Justin Fletcher and John Sparkes. This looks amusing and crazy, of course, but I thought they would actually be going up into space but it's mostly set entirely on Earth again. Oh well, still looks fun. You can still watch the teaser trailer for Shaun the Sheep: Farmageddon here, to see the original reveal. Strange lights over the quiet town of Mossingham herald the arrival of a mystery visitor from far across the galaxy… but at nearby Mossy Bottom Farm, Shaun has other things on his mind, as his mischievous schemes are continually thwarted by an exasperated Bitzer. When an impish and adorable alien with amazing powers crash-lands near Mossy Bottom Farm, Shaun soon sees an opportunity for alien-powered fun and adventure, setting off on a mission to shepherd the intergalactic visitor home before a sinister organisation can capture her…can Shaun and the flock avert Farmageddon on Mossy Bottom Farm before it’s too late? 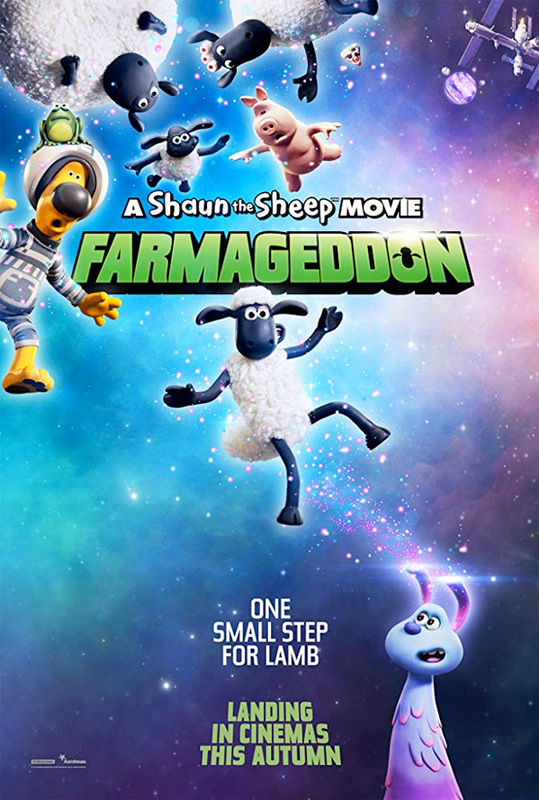 A Shaun the Sheep Movie: Farmageddon is directed by filmmakers Will Becher (a lead animator for Aardman) & Richard Phelan (a storyboard artist for Aardman) both making their feature directorial debut. The screenplay is written by Jon Brown and Mark Burton, based on the characters created by Nick Park. StudioCanal will release Aardman's A Shaun the Sheep Movie: Farmageddon in the UK this October. Lionsgate will then release the film first in the US starting on December 13th this year. Who's in?